The 642-813 Real Practice-Lab gives you access to a real Cisco network including Cisco 2800 series Routers, 3750 and 2950 series Switches and Microsoft Windows devices that enable you to gain hands on skills in Cisco Switching technologies. By completing the lab tasks you will improve your practical skills in configuring, managing, monitoring, and troubleshooting Cisco Switching technologies, implementing and managing VLANs and VLAN ACLs (VACLs), layer 3 switching technologies, advanced services and high availability. Becoming proficient in these tasks will also help you understand the objectives and competencies required by the Cisco CCNP SWITCH certification exam. Using the Real Practice-Lab to its full potential will help you develop your skills in becoming a highly skilled network engineer or help you develop your current skill level in Cisco switching technologies. Once you have used the lab for either 25 / 50 or 100 hours we will acknowledge this achievement by issuing you a certificate. This can be validated by potential employers or managers alike, proving your abilities in Cisco Switching. Switch operation and configuration: Learn how to configure and manage a Cisco switched network, learn how to use advanced troubleshooting techniques to solve common problems found in real networks. 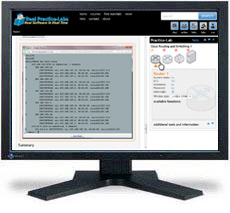 Use advanced commands and see their output in real time on real layer 3 capable 3750 series Cisco equipment hosted online. Advanced VLANs, Spanning-Tree and link aggregation: Learn how to create VLANs, modify advanced STP settings and aggregate links to build port-channels increasing available bandwidth between switches. Multilayer switching and high availability: Use the advanced features of Cisco 3750 series switches to build a highly available layer 3 switching environment, using the advanced services of these powerful devices you can create a routed environment which interacts with other Cisco routers observing key differences between routed ports and SVIs. Security: Learn the fundamental topics of how to secure Cisco device access, connectivity across the network and protect the environment from rogue devices using advanced techniques all on real Cisco 3750 and 2950 series switches.